Not to be confused with the Starter Digimon, Agumon (Anime 2006). 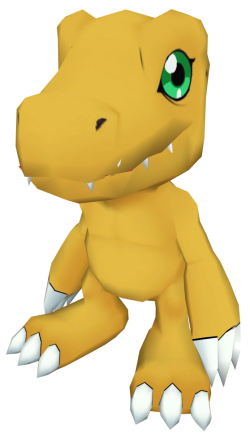 Agumon (Classic) is a Reptile Digimon. 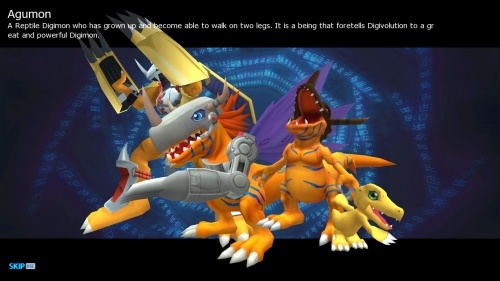 It is a short and stout Tyrannosaurus rex-like Digimon standing about 3 feet tall, and has amber orange skin and light green eyes. It also has flattened forearms with broad, three-clawed hands, though early artwork for the Digimon virtual pet depicted its hands with four claws, and distinct pectoral muscles. His legs and arms are shown to be very vascular. Its tail is stubby, and its head and snout are almost as large as the rest of its body. Uses sharp fingernails to damage the opponent. Collects blazes then shoots them at the opponent. A Reptile type bipedal Digimon. Although this Digimon looks naive, it has the potential to be a great Digimon. Ultimately, it will evolve into WarGreymon, the True Warrior. This page was last modified on 13 April 2019, at 22:36.